Three alligators will charm toddlers as they take turns chomping with every step! 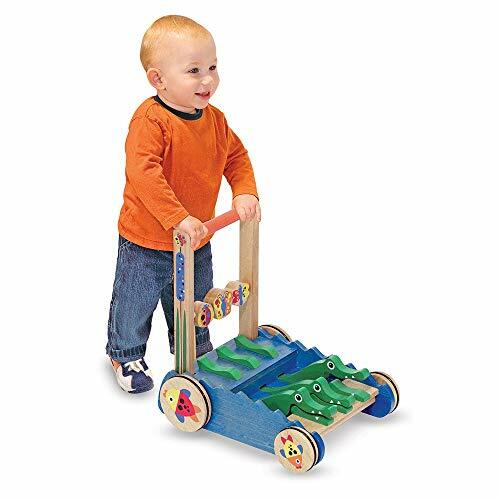 This multisensory wooden push toy encourages walking and discovery. Graphic details include cattails on the handle supports, fish on the wheels, and spinning butterfly and ladybug beads. This cheerful toy encourages gross and fine motor skills while developing hand-eye coordination. It’s brightly painted with child-safe paint. 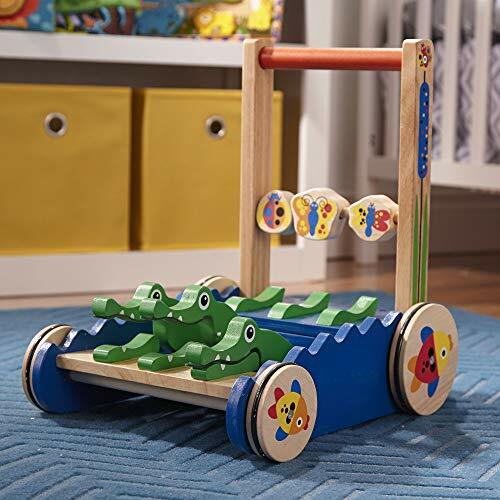 The Chomp & Clack Alligator Push Toy is designed to help children 12 months and older develop and improve agility and balance, and to create a fun opportunity for exercise. The handle is easy to grab and hold, so your little one can steer the push toy in straight lines or along wandering paths. Non-skid wheels let your child walk along smooth surfaces without moving too fast or leaving unsightly marks on your floor. The Alligator Push Toy is a delightful gift for kids 12 months and up. Add the Melissa & Doug First Play Wooden Elephant Rocking Stacker to round out the hands-on play experience and give kids an engaging option for screen-free fun. For more than 30 years, Melissa & Doug has created beautifully designed imagination- and creativity-sparking products that NBC News called “the gold standard in early childhood play.” We design every toy to the highest quality standards, and to nurture minds and hearts. If your child is not inspired, give us a call and we'll make it right. Our phone number is on every product!